Several months ago I wrote a blog called, “Ten Steps To Marketing Relevance,” which listed priorities for anyone working to build or renovate a marketing department. Interest has been high, so now we’re going to dig deeper on each of those ten priorities. I look forward to your comments and conversation. I recently heard a powerful presentation by Patty Azzarello, Technology CEO, consultant, and author of RISE (which I recommend reading). In the book, Patty states, “Standout leadership is not just accepting the team you inherited; it is building a team capable of working at a higher level.” I would add that the bar is much higher now that it was just ten years ago. Today’s modern marketing departments need a different composition to meet goals like customer analysis (versus customer profiling), response tracking (versus impression estimation) and revenue participation (versus lead generation). Tools are important too – we’ll discuss those in a future blog. But people are key. New roles include Technologists who serve as liaisons to IT as marketing becomes increasingly digital and technology-driven; Customer Insights experts who handle research and data analysis to help marketing understand and react to the “voice of the customer;” and Content Managers (not copywriters) who develop everything from corporate thought leadership to business unit sales collateral. Here’s how Forrester and the Executive Board see the shape changing. 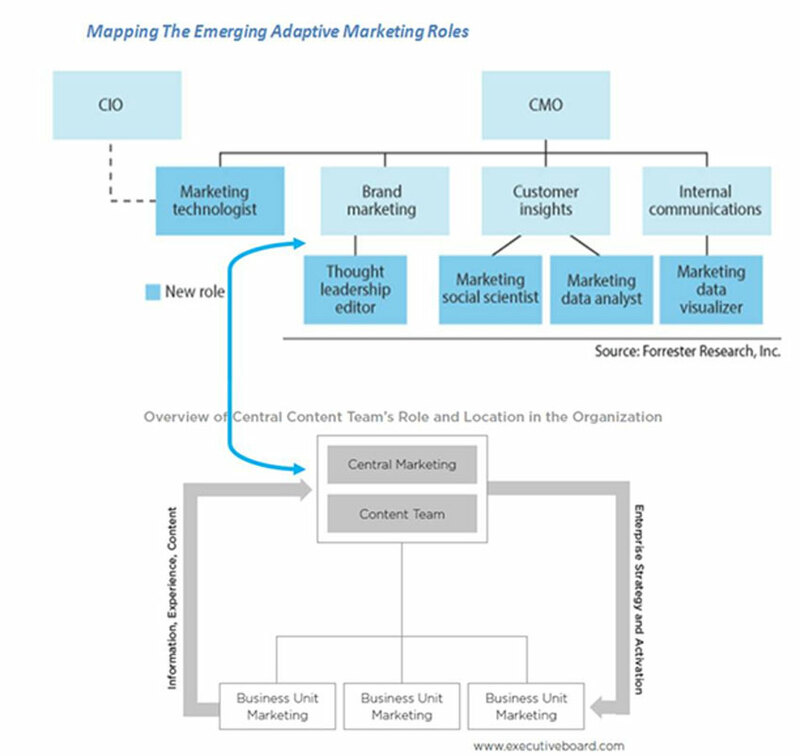 In this new environment, the CMO oversees teams focused on digital development, content marketing, product marketing, customer insights, and PR and communications. Whether centralized or embedded within the business units, marketing teams must have strong links to the sales/RM teams, training, and R&D/product. The CMO must also stay in synch with other C-level executives (especially the CIO/CTO and CFO) to ensure efforts and funding are in line with strategies. It’s a brave new marketing world, and modern marketing organizations must reflect that complexity. Is your organization rising to the challenge? This entry was posted in B2B Marketing, Content Marketing, Digital Marketing and tagged B2B Marke, content marke, Digital Marketing. Bookmark the permalink.